After he won the British Open, McIlroy became the number one golfer in the world meaning that he had won the most money. This weekend, Rory McIlroy proved that he is also the best golfer in the world. He was one stroke back at the end of the first round on Thursday by posting a 5 under par 66 at the beautiful Valhalla Golf Club near Louisville, Kentucky. He shot a 67 on both Friday and Saturday and held the lead over Bernd Wiesberger going into the final round on Sunday. The final round of the 2014 PGA Tournament was one of the best rounds of golf we have seen this year, perhaps the very best. McIlroy started the day with a one stroke lead over the field but quickly found himself one stroke down after managing bogeys on both the 3rd and 6th holes. McIlroy got back one stroke by scoring a nice birdie on the 7th hole and ended the front nine at one over par. Things were looking grim for the young man from Ireland. But then, Rory took only two swings of the club to bring himself within 7 feet of the 590 yard long tenth hole to start the back nine with a spectacular eagle. Sportscasters would later show his second shot on 10 as the outstanding shot of the tournament. McIlroy went on to score birdies on the 13th and again on the 17th to clinch the title over a resurgent Phil Mickelson who finished just one stroke back at -15. Young American golfer Rickie Fowler and Henrik Stenson from Sweden tied for third place at -14. Winning the British Open and the PGA Tournament back to back put Rory McIlroy in a very exclusive club consisting of only Tiger Woods and the legendary Jack Nicklaus. These three are the only members on the PGA Tour to ever win four majors before the age of 25. 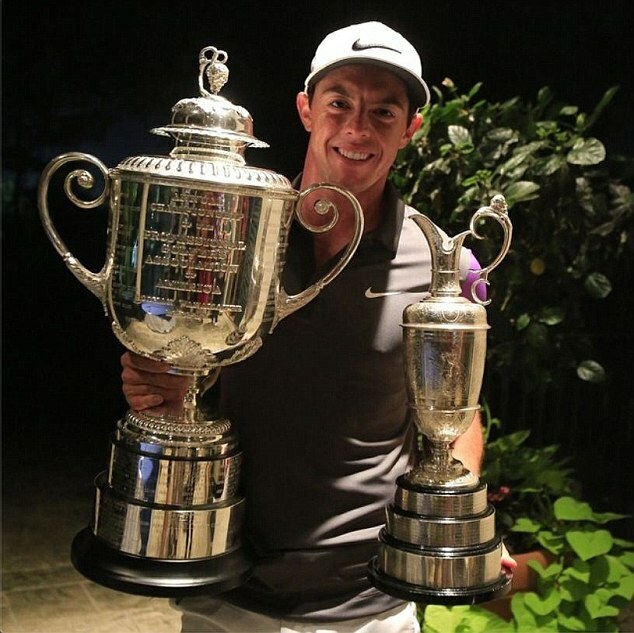 When McIlroy won the 2011 US Open, his first major and he was only 22 years old. He won by 8 strokes and set a new US Open record. He won the 2012 PGA Championship at the age of 23 by 8 shots once again. This kid is something special. When he won the British Open this year, McIlroy became the first European golfer to win three different major golfing events. Rory McIlroy finished the PGA Tournament on full throttle while almost everyone else in the field was running out of gas. The future is wide open for the young golfer from Ireland.